Another 2012-dated collector set from the United States Mint is gone and its sales are at a 50-year low. The bureau on Monday listed the 2012 Mint Set as "Sold Out," placing its online product page in the "No Longer Available" section. Sales of the 2012 Mint Set ended at a 50-year low. Released on May 21, 2012, the latest U.S. Mint sales figures as of Jan. 28, 2013 show 2012 Mint Sets at 392,000. That marks a substantial declined from the previous year’s set of 533,529 and, more interestingly, it will have the lowest mintage total since the 1962 Mint Set logged sales of 385,285. 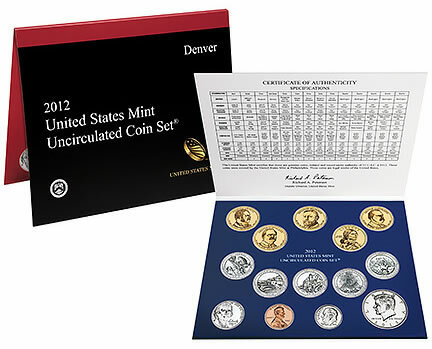 Update: The United States Mint reported final sales of the 2012 Mint Set at 392,224. A shorter sales cycle is one reason for weakened figures in 2012. Last year’s Mint Sets, Proof Sets and Silver Proof Sets were available from seven to eight months compared to a period of almost two years for the 2011-dated sets. Recent buying levels were decent for 2012 Mint Sets. Many more could have sold based on the weekly gains since late November of 11,629; 9,921; 7,558; 5,490; 2,549; 3,613; 3,307; 2,206; and 1,979. Officially dubbed the 2012 United States Mint Uncirculated Coin Set® and last priced at $27.95, the set includes 28 coins parsed into two folders of 14 coins each. One folder has uncirculated quality coins from Philadelphia with "P" mint marks and the other folder has uncirculated quality coins from Denver with "D" mint marks. The coins include all denominations and designs released last year, including the four 2012 Presidential $1 Coins, the 2012 Native American $1 Coin, the 2012 Kennedy half-dollar, the five 2012 America the Beautiful Quarters, the 2012 Roosevelt dime, the 2012 Jefferson nickel and the 2012 Lincoln cent. A wake up call for those who think coins and sets will be on sale forever at the US Mint. The subscribers and collectors on the ball got their 2012 coins in 2012 rather than waiting until 2013 or 2014. More evidence that Dep Dir Peterson is no longer “in charge” and that decisions are being made rather than Peterson’s “lets wait and see” attitude. Now if the Mint would only issue a policy doc regarding the sales duration of these collector coins and sets so that people could plan ahead rather than be surprised with a sudden ending of sales. I have been following this quite closely and I think the main reason is that the basic sets cost $31.95 (proof), $67.95 (silver) and $27.95 (unc), which must be out of the price range for the casual collector. I wonder what sales would be if they offered a traditional 6 piece set (penny, nickel, dime, quarter, half and dollar) for $12 to $14. I think it is concerning as a collector to see the proof sets sales at a third of what they were before the state quarter program even started (mid 90s). Which quarter should they use for the 6 piece set? Which dollar? 5 quarters times 5 dollars = 25 different 6 piece sets. I’ll stay with the full blown sets we’re getting now. $3/mo is a small price to pay for a basic set in my opinion. I think there’s more of a lack of interest in coins in general. I myself usually use credit cards and hardly ever get change anymore. If that’s the trend then no wonder interest is waning. Pricing could be part of it but I think there are bigger issues in play than just pricing. I think the glut of coins in the past 13 years… the quarters dollars pennies…has pretty much exhausted the collectors. I know many of these sets are selling on eBay and elsewhere at cost or just above what the mint charges. Many of the people who jumped into coin collecting because of the quarters are bailing as well – because you can buy complete sets of those in uncirculated or even mint set uncirculated condition for less than the cost of the mint sets. The costs the last few years are excessive. I am guessing many people have decided the basic coin sets are nice – but with silver and even proof sets available they are shifting away from them. I wonder if the low sales had anything to do with the mint not sending them to listed subscribers. I realized recently that I had not received my 2013 uncirculated set despite a valid subscription and credit card. I always receive my silver eagle proof, so my account is working. I checked my orders and found that I had not received a 2012 uncirculated set last year.